Senator Chuck Grassley in his Washington, D.C. office. U.S. Supreme Court nominee Brett Kavanaugh and the woman who accuses him of sexual assault will testify under oath before Iowa Senator Chuck Grassley’s panel next Monday. Judge Kavanaugh’s confirmation hearings earlier this month were punctuated by protests from the audience and from Democrats within the Judiciary Committee. Grassley, a Republican, was asked how he’ll maintain order during Monday’s meeting with volatile accusations now in the mix. U.S. Capitol police arrested 227 demonstrators during the four days of Kavanaugh’s hearings this month. Most were charged with obstruction or disorderly conduct and were fined. Grassley says he recognizes there will likely be outbursts during Monday’s hearing and he’ll be vigilant to stay on task. 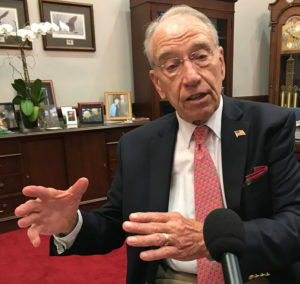 “I intend to do like I did those four days, keep the meeting going, let the police do their job,” Grassley says. “I intend to be respectful. These are very worthwhile things for us — they’re very necessary things for us to be looking into and I hope my colleagues will be as respectful, too.” Christine Blasey Ford accuses Kavanaugh of physically and sexually assaulting her when they were both in high school in the early 1980s, claims Kavanaugh staunchly denies. Grassley says Ford “deserves to be heard.” He was asked whether he’s worried the accusations may torpedo Kavanaugh’s chances of being seated on the nation’s high court.